Insulation is by far the most commonly misunderstood aspect of a camper van conversion. And for good reason– there is so much misinformation out there! 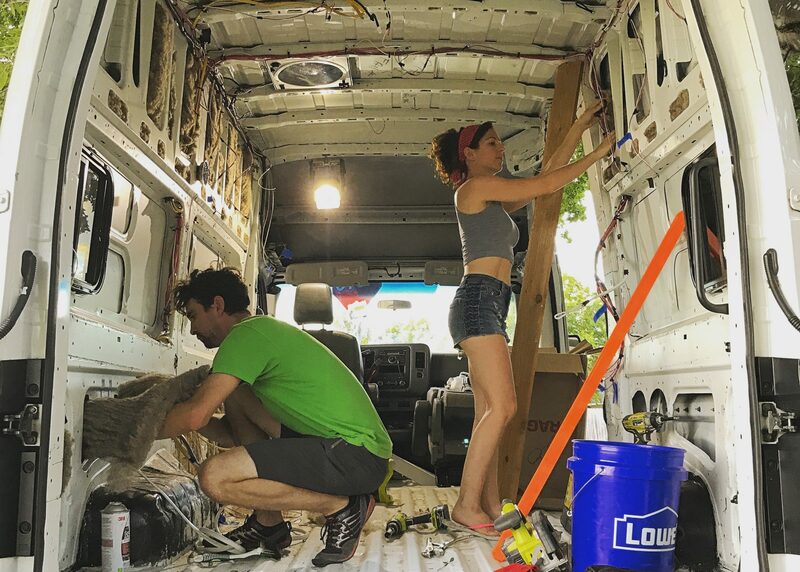 We spent weeks researching radiant barriers, vapor barriers, and dozens of insulation options for our sustainable DIY camper van. We’re sharing the lessons we’ve learned to help you make the best decision for your camper van insulation. Don’t make the same mistakes we’ve seen hundreds of vanlifers make! Put down that Reflectix and read this post! Disclaimer: Between the two of us, we have 15 years experience in construction and green building, but we are not engineers or physicists. Although we have strong opinions that are backed by research, we are not saying that our word is the end all be all. We are 100% open to ideas and would love to hear your comments and suggestions, especially if you are an engineer or physicist or work in the insulation industry! Lesson One: Don’t waste your time on a radiant barrier! They do (almost) nothing! Radiant barriers are VERY popular in the van build world, so we’ll likely get some backlash on this. Regardless, we’ve done the research and we’re ready to make a bold claim: Everyone you see installing Reflectix on their van walls is doing it wrong! When we first started googling “how to insulate a camper van” we saw Reflectix everywhere. Instagram, same thing. Even Sportsmobile (one of the main camper van companies in the US) has an “arctic package” that includes Reflectix on the whole interior. In theory, this concept works– just like the reflective visors you put under you windshield, reflective material inside a van can reflect away some of the sun’s heat (or keep heat in the van during the winter). The problem is that everyone we’ve seen is installing Reflectix incorrectly, which renders the product useless. If you skipped the video, here’s the takeaway: Reflectix does a great job of blocking radiant heat if it’s installed properly. For installation to be correct, there MUST be an air gap of at least 3/4″ between the foil and any other material. If there is no air gap, the foil acts as a conductor and will actually work against you! An “air gap” must literally be a void space for air only – no paneling, no batt insulation, nothing can touch the Reflectix or it will not block radiant heat. So when you see people sticking insulation directly on top of Reflectix, they are wasting time, money, materials, and actually making it easier for conductive heat to pass through into their van. To properly install a radiant barrier in your van just isn’t feasible– you would need to run ¾” furr strips around the entire interior of your van and then ensure no insulation or paneling touches the foil. This would take up a LOT of valuable space in your van. Is it worth it? We don’t think so. Radiant barriers aren’t used much anymore in the residential construction industry because they don’t do very much. Independent studies suggest radiant barriers only reduce cooling energy bills by approximately 2 to 10 percent. It’s estimated that the r-value of a radiant barrier is at best R-4.2. This small savings isn’t worth it for the amount of space you’d lose in a proper installation. We’re grateful for other vanlifers out there who are helping to spread the truth about radiant barriers. Don’t waste your time or money! Lesson Two: Don’t install a vapor barrier in your van! Lesson Three: Choose non-toxic, moisture-resistant insulation! There’s not a lot of indoor air in your van, so it’s important for your air quality to be as healthy as possible. Sorry to be a buzzkill, but most conventional insulation options have toxic or potentially-toxic chemicals. Choosing non-toxic camper van insulation was important to us, so we were able to rule out the following types of insulation right away: fiberglass (toxic when inhaled/installed), cellulose (formaldehyde binders & flame retardants), rock wool (formaldehyde binders), foam board (toxic styrene), 3M Thinsulate (contains potentially toxic polypropylene), and spray foam (contains potentially toxic polyurethane and is also both difficult to install & non-removable). NOTE: We started going down the rabbit hole researching all the potentially toxic chemicals in insulation and other commonly used construction materials. Ultimately, we decided to exclude this information from this post, but if y’all are interested in the dirty details about various construction products (and the reason we’re building sustainably), please comment below and we’ll write a post about it. We narrowed our search down to three non-toxic insulation options: recycled denim, hemp, and wool. Denim is not moisture resistant (when it gets wet, it stays wet), which can cause mold. Hemp seemed like a good option, but it typically comes in concrete blocks which would be difficult to install in all the tiny cracks and crevices in the van, so we decided on….SHEEP WOOL! Sheep wool is the BEST non-toxic insulation for your camper van conversion– it’s sustainable, naturally fire-resistant, breathable, doesn’t retain moisture, easy to install, and it’s literally sheep wool, so there are no toxic chemicals. Check out Black Mountain manufacturer information for information about the wool we used. 0) Step 0 is to deep clean your van. Deep, deep clean the van. Take out the floor mats and clean them, get deep into the crevices and clean everything. This is your new home and this is your only opportunity to do a truly deep cleaning of the entire van before you start your conversion. Be sure to identify any potential mold areas and spray with a mixture of bleach and water. Allow the van to air out completely for a couple days after spraying bleach before you start your conversion. 1) Identify and tape off the areas you plan to use sound damping. We recommend using this on top of any exposed metal that’s not going to have wood, paneling, or flooring surface on it, including entryways, wheel wells, and step areas by the doors. Depending on your flooring selection, you may want to cover your entire van floor with a layer of the Noxudol, but we didn’t because we added cork as part of our flooring installation. Using an old paint brush, spread a thick layer of the Noxudol on the applicable areas. Repeat for 2-3 coats and be sure to let the product dry between costs. 2) Start pulling apart one of the rolls of wool and use the small pieces to fill all the cracks and crevices in your van. Be thorough to ensure you’re insulating deep in every gap in the walls, floors, and even in the small holes in the ceiling and wall beams. These areas can be tricky to access (we took advantage of having our 11-year-old nephew with little hands helping us out! ), but do your best to be thorough. There were some places in the panels surrounding the doors/windows where the holes were too small to access, so we actually drilled holes in the sheet metal to reach them. You want to fill as many of the small cavities as possible with wool. Don’t force too much wool in these areas, just moderately fill the spaces completely. 3) Screw in 1/2″ furr strips on top of all the wall and ceiling beams. This will give you something to attach the wall paneling to and provide more space to fill with insulation. 4) Spray the wall and ceiling crevices with adhesive and stick the roll of wool to the walls and ceiling, spraying each small area at a time as you go. Use as little spray adhesive as possible and wear a mask– it’s very sticky and doesn’t take much– it’s just meant to hold the material in place until you get the wall panels up. (For a completely non-toxic option, you could also take painters tape and criss-cross it over the wool to keep it in place.) The wool comes in 3″ thick rolls, so that will be the thickness of the insulation around the interior of the van. You don’t want to squish the wool too much because it’s supposed to be installed at the thickness it comes. NOTE: Be sure to previously identify and mark where you will have your vent fan, AC, windows, or anything else that will be cut into the metal of your van. You’ll want to block off these areas so you don’t insulate over an area that’s going to be cut. 5) In order to save as much head room as possible, we decided to only insulate the floor a small amount. We didn’t raise the floor up at all, we just utilized the very small 1/4″ gap in the existing floor ridges that otherwise would have been dead air space. We rolled small pieces of the wool between the floor ridges and installed our 3/4” plywood subfloor directly on top of the beams and small rows of wool. We added extra insulation when we installed our camper van flooring, by adding a layer of cork underlayment below our linoleum flooring. 6) Once the van is covered in insulation, you’re ready to put up the wall paneling. We recommend doing this step soon after completing insulation, so the insulation doesn’t become loose and fall down. I’m not going to lie, it smelled a little like a petting zoo at first, but after a week or so, all the essence of barn animals was gone! We’re loving the wool insulation so far– the van stays cool when it’s hot and warm when it’s cold! What type of insulation are you using for your camper van conversion? We’d love to hear your comments and suggestions! Loved reading your blog post about why you selected sheeps wool over all others. I was 100% sure that I was going to use Earth Wool insulation but after reading thoroughly through your post I’ve changed my mind. I’d love to know more about how your van is dealing with condensation (in winter of course) between the Wool and metal skin if you can see that? I’m assuming that if the Wool can cover every surface area of the outer metal skin then it would be very hard for moisture to find its way there and in-turn stop condensation building? Thanks again for your SUPER helpful blog and can’t wait to hear back from you. Hey Anthony! Thanks so much– I’m stoked that this post was helpful to you! So far, the wool has kept the van nicely insulated and I haven’t noticed much condensation inside. I recently removed some of the wall paneling to fix something behind it, and the wool insulation inside the wall cavity was dry– no moisture or condensation. Since I didn’t use a vapor barrier, the metal is able to breathe and moisture can flow in/out without getting trapped inside the walls. So far, it’s been working great! Let me know if you use wool– I’d love to hear about your experience with it! I really like what you are doing and that you build the van with sustainable materials. But in my opinion wool is not a good solution regarding how it is “made” and how sheep is treated during shearing. I have seen lots of videos where they had big cut outs in their skin, so I decided that I don’t want to use wool anymore. You have mentioned hemp – this seems a good solution for me so I’ll try to get this for our van somewhere. Thank you for all the hints in your blog. You might want to look into Roxul if you haven’t done your project yet. It’s supposed to be mold and fire resistant and is mineral wool, which is NOT an animal derived product, rather is derived from molten glass, stone or slag (industrial waste) that is spun into a fibre-like structure. Hey, thanks for your comment! I think Roxul would need to be easily manipulated so it could fit into all the tiny crevices of the van. Also, the batts would need to be cut down since the van cabinetry/walls aren’t made with 2x4s but thinner plywood. Thanks! I used Roxul in my basement, and it is easily cut and manipulated. Batts can be cut with a serrated knife through the center to make two full size batts at half the thickness for an application like this. You’ll lose some of the RF value and sound deadening, of course, but it still should be sufficient for a van project. Thanks for your input! I can’t speak to Roxul because I am not familiar with the chemical composition of the product. I will say that I am very happy with the sheep wool batts I used in my van! While Roxul/Rockwool’s batting advertises its “greenguard” status, it is not green. The reason it is formaldehyde free is because they’re vacuuming it off the batting and shooting it up their stacks at their factories. They’re trying to build a Rockwool batting behemoth in Ranson West Virginia. The permitted air pollution for the proposed factory is unacceptable. The enormous reliance on coal, gas, and toxic chemicals at the molten basalt rock and slag factories is unsustainable. Hi! I hope my post isn’t confusing– I did not use Roxul in my van and am not a proponent of doing so. This is an installation guide and review for sheep wool insulation. Thanks! Hi Janice! Thank you so much for commenting– it really means a lot! It’s great to hear that this article has been helpful! thank you for this post, I’m planning on getting a Sprinter soon and this non toxic insulation seems perfect. I haven’t seen anybody else use it but im guessing they aren’t concerned with the toxicity of their insulation, which they should be! thank you again! Thanks Danny! I’ve been really happy with how the wool insulation has worked out so far. Congrats on your future project! That seems to be the standard between efficiency, non-toxicity, hydrophobic material. Hey! A lot of people have great luck with Thinsulate and I think it’s a great choice! I personally like that wool is not synthetic so you know exactly what you’re getting. Thanks for your comment! Hi Ken, the wood paneling is very thin birch tongue and groove that you can purchase at Home Depot. I chose it for the texture and because it’s extremely thin, so won’t take up much wall-to-wall real estate. Thanks! My partner and I are strongly considering using sheep wool for insulating our Mercedes Metris. I was nervous about the long-term moisture control properties of wool, especially considering it will be placed next to the cool metal of the van (or in some cases, a sound deadening material). Comforting to hear you say that the wool area was still dry and problem-free last December when you had to remove part of the paneling. Now that it’s been a year, are you still happy with your insulation choice? Also, for all those little holes would you recommend using fine pieces of wool or perhaps going with a gaps and cracks spray foam? And are you familiar at all with Havelock Wool insulation products? I am curious if there is a difference amongst the different companies. Thanks so much! Appreciate the information in your blog! Hey there! I’m happy with it but unfortunately I don’t really have much that I can compare it to– I’m not sure if other insulation would have been more warming or not. It would be really cool to do a van experiment and see which insulation really keeps it warmer. I haven’t had any moisture issues though! Best wishes and thanks for following the blog! Have you compared wool to hemp insulation (with lime)? I like the idea of non-toxic insulation and was curious if it would he a good option. On a side note, either wool or hemp is an organic material and when coupled with the metal from the van, may create an orgone accumulation effect. This is a huge benefit of your choice to choose a natural material. Hey, thanks! I’ve heard hemp wasn’t as moisture-resistant as wool, but I didn’t do a ton of research about it so I can’t say for sure. I’ve heard it’s a really common selection for eco builders! Hi I’m new to the campervan conversion world and have lined my VW T5 with neroprene and then sheeps wool. Loved the article and I’m so glad I found a website that showed a conversion using sheeps wool! I’m about to start the tailgate and line that with the wool too. I’m just concerned about the van being too insulated. Is that even a thing? Also, I’ve seen so many people then add some reflective material on top of the soft insulation that they have used, whether it be fibreglass, or other materials. Is that side really necessary or can I just install panels on top of the sheeps wool and it be pretty insulated? Any help would be very much appreciated as sometimes I feel a bit overwhelmed with what I’m doing. Hey Louise! Unfortunately I don’t know anything about Neoprene and how it affects moisture. I recommend watching the video in this post because it addresses your reflectix question– using reflectix that way is not effective without an air gap. I recommend insulating your van as much as possible but look into the moisture issues as well. Thanks! Hey! I don’t know if my comment went through yesterday, but I recently bought a transit van with my partner and I am trying to make a case for sheep wool insulation. I strongly believe the most environmentally conscious avenue possible is the way to go. Do you have a pricing esitmate for the sheep wool you used similar to the sound proofing cost you provided here? It would be greatly appreciated (sheep wool insulation prices seem hard to find)! Hey! I don’t remember off-hand but if you google the product, you can see prices. I used just under 9 rolls: Black Mountain R-13 sheep wool 16″ rolls. Thanks! Hello! I’m planning to use Black Mountain wool in my van conversion, but I have a fiberglass top. It is a totally smooth surface with no spaces to stuff the wool like the roof of your van has. Any ideas for how to ( or if I even need to) insulate my fiberglass roof? Hey, I don’t know the R-value for fiberglass but heat rises and I would definitely recommend insulating the ceiling. We installed wood furr strips, insulated between them and then put tongue and groove boards on top of that. Best of luck on your build!